On Sunday night my husband and I went out for Italian food. He ordered what he always does: rigatoni with meat sauce. Since I was having the kind of weekend where I didn&apos;t care about my physical health, I got linguine carbonara. "Why do you always order rigatoni?" I asked Steve, and he gave me a very well-thought-out answer about rigatoni&apos;s ideal size, squishiness and the way the sauce gets inside the little tubes. "What&apos;s your favorite pasta?" he asked me, and I realized I couldn&apos;t come up with an answer quickly. I love so many different kinds of pastas and I love pasta so much I could eat it directly from the boiling water with no sauce added. How to choose? 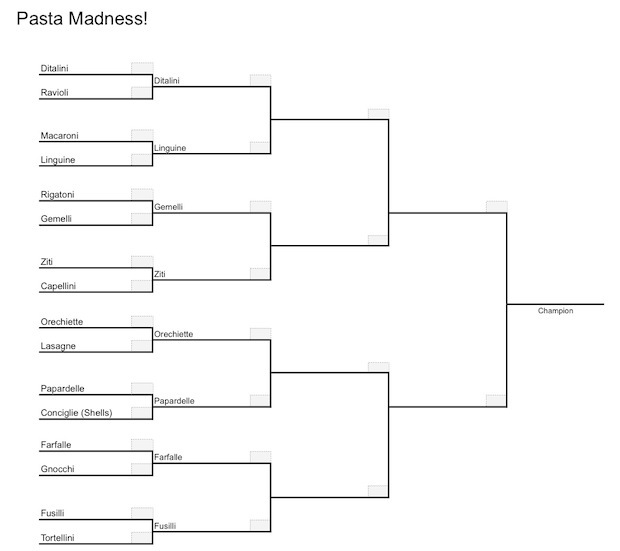 Since it&apos;s March, I decided the best way to determine the most superior pasta was through a tournament bracket. Ditalini vs. Ravioli. 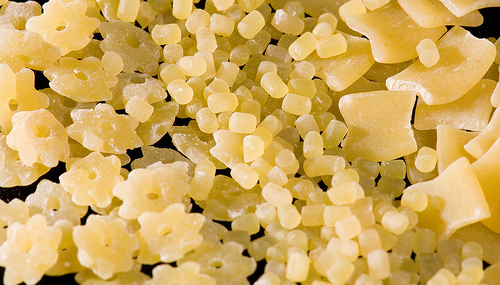 Ditalini is a bit of a pasta Cinderella story. Rarely do you think of it as something you&apos;d want to order, but typically, it&apos;s the best part of whatever you&apos;re eating (pasta e fagiole, minestrone, etc.) The little tiny tubes are fun to eat. Ravioli, on the other hand, is almost always a disappointment. For every one time you get some good ravioli in good sauce you get four flat disappointing bland pillows in plain tomato sauce. Winner: Ditalini. Macaroni vs. Linguine. Macaroni and cheese is one of my favorite foods in entire world, but macaroni would be nothing without cheese, which is its greatest limitation. I like linguine because it&apos;s like a better spaghetti. Its flatness gives it friction and better bite than those slippery round noodles. Winner: Linguine. Rigatoni vs. Gemelli. Have you had gemelli before? It&apos;s like the best of all worlds (in that a single piece of pasta is actually two pieces of pasta twirled together.) It&apos;s got good bite, its ridges are excellent for sauce-application and it feels a little exotic. Rigatoni, on the other hand, is typically overcooked and does become a squishy, floppy mess. Sorry Steve. Winner: Gemelli. Ziti vs. Capellini. Angel hair pasta will make a jerk out of you. It&apos;s messy to eat and not nearly as fulfilling as a fettucine or linguine. Ziti, on the other hand (or penne, that&apos;s fine too) is great either in a regular sauce or, even better, baked, with crispy brown edges. Get out of here, capellini. Winner: Ziti. Orecchiette vs. Lasagne. Come on, how did lasagne even make it into this tournament? The noodles are nothing on their own. Have you ever encountered lasagne noodles outside of lasagna? Also, I tried making lasagna once and the noodles all got stuck together and I got really mad. Orecchiette are adorable little ear-shaped pasta that are great at collecting sauce and peas. Winner: Orecchiette. Papardelle vs. Conchigle (shells). Papardelle is one of those pastas that doesn&apos;t seem to exist outside of restaurants that make their own pasta and serve it with something like boar ragout. It&apos;s delicious. Shells, on the other hand, always sound great and then you wonder how a piece of pasta filled with cheese and meat and sauce could end up so bland and disappointing. Winner: Papardelle. Farfalle vs. Gnocchi. Gnocchi is like fish tacos. When you have it done right, it&apos;s the best thing ever and when it&apos;s not done well, which is typical, it&apos;s just a gluey (or fishy) mess. Farfalle are fun little bowties that work great hot or cold and it&apos;s fun to bite them in the middle. Winner: Farfalle. Fusilli vs. Tortellini. This was a really tight call and I had to ask the refs (IE my colleague Daniel who was sitting next to me during the time of writing) for a final decision. Daniel is going with fusilli due to its versatility whereas, according to him, tortellini has much narrower applications and has to be purchased fresh. Plus: Fusilli Jerry. Sorry tortellini. Yours was a Cinderella story but: Winner: Fusilli. What are your thoughts on the results of this round? Did anyone get robbed? Any underdogs you&apos;re rooting for? Stay tuned for our second round next week!